More like 3.5 stars. A gripping tale of a fallen American satellite and the three-way competition to recover or destroy it. Well plotted and written. Credit given to co-author Alton Gansky. I normally don’t read this type of book, but aside from a somewhat clunky beginning this one grabs the reader and drags him or her through a complex tale some of which parallel today’s headlines. One of the competing elements is a Russian splinter group, unhappy with the depths to which post-Cold War Russia has fallen, intend to re-establish the Soviet Union. (Too bad that description just as easily describes the narcissistic tyrant who currently leads Russia.) The authors portray China as the larger threat to world peace; amazing what a difference three years can make. The heroic action is leavened with enough human interplay and family connections to give depth to what is often non-stop action and gore in this type of story. Undoubted Christian faith among some—not all of the team—but no hard-sell religion. Interpersonal humor is well-presented and appropriate. Angel-12, the object of all this mayhem, contains several technologies of interest. One, its imaging system is admitted from the first. Second, the nuclear power plant is admitted early in the story. The third reveal is held until the last pages. 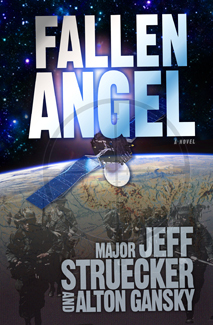 This is book three of the series, but the satellite angle attracted my attention. A serious reader of this genre will want to start with Certain Jeopardy, the series opener. This entry was posted in Book, Reviews and tagged America, book review, China, fear, interception, nuclear power in space, Putin, reconnaissance satellite, Russia, sacrifice, satelite, special operations by andreart2013. Bookmark the permalink.